92 percent of people never achieve their New Year’s resolutions. That’s a huge amount, and yet so many of us, come January 1st, will set an intention that we would love to achieve but fail. And herein lies one of the main problems with New Year’s resolutions and why this blog post is being published on the last day of October. If we wait until the last few days in December to formulate our next year’s goals we won’t own the outcome. We’ve all heard the stories of people who set goals and then manage to achieve them to great success. At its core, the human brain can’t differentiate between what we want and what we have. And, as such, setting goals can have an extremely powerful effect on how we see ourselves and how we show up to the world. When you set a goal and make a full commitment to achieve it, you can shift your own self-identity in a very real way. The key to commitment lies in time, focus, and accountability. So let’s start with ACCOUNTABILITY. Last year, I engaged a strategic coach and productivity expert to help manage my career growth. His name is Clark Vautier and he has made a massive impact on my process of getting things done. He’s also been there as an accountability partner whom I can’t shrug off. One of the things I realized about myself being a Lion (if you haven’t taken my Personal Brand Quiz to see which Animal best represents your personal brand you can do it here) is that I’m not very good at closing the loop as there’s always another great idea that is demanding my attention. Understanding this, I’ve made sure I have firm accountability partners in my life who hold the line, keep persisting, and make sure I am closing the loop on projects. Clark does this with The Richard Janes Company, and our new Director of Operations, Chris Strompolos, does this with Fanology. What can you take from this? If you are setting goals for 2019 who will you ask to keep you accountable? That you mentally agree that each time they nag, you will remember you asked for this. Find that person or group and you have a much greater chance of success. A great book to read on this is Alan Deutschman’s Change or Die. Where focus goes, energy flows. When we wait until the last few days of the year where we are out having a good time and with so many other things on our mind, we can’t give our goals the correct focus. We need to prepare ourselves for the fight ahead. Group 1: Physically practiced for one hour each day. Group 2: Only practiced making the throw through mental visualization. Pretty amazing, huh! Your mental game is almost as important as physically doing it. By setting your intentions for 2019 now, in October, you will have time to start the mental game, get prepared, start seeing what it is you need to do, so that by the time you start taking action come January 1st, you are focused and in full stride. Now, this is where Clark has made a huge impact on my life. He flew out to Oklahoma City where my family and I now live and we dedicated time to setting my 2019 goals. Society pushes and pulls us so much that for many of us our goals can be sucked into the land of the ego. Money, job, looking great, new ‘things’. But if we really give ourselves time to think about what we really want to achieve deep down – things that will have a material impact on our happiness and those around us – we need to give ourselves the time to explore different goals and objectives. And then, just as importantly, time to challenge them to see if there is a strong enough reason to make the commitment. With my clients that filter has always been the three words of your authentic personal brand. Does the goal speak to who you are at your core, at your greatest? What Clark brought to the table is a process to exhaust all the options before you apply the filter. As many of you know, I am a HUGE fan of Post-It notes. I should really own stock in 3M. Clark has me write down every goal I could possibly think of – each on its own Post-It note. Personal. Business. Outlandish & Bombastic. Easy & nonconsequential. From there we put each one through a set of filters to determine which are really the most important and should form part of the 2019 master plan. This exercise really gets you thinking and brings up ideas that have been lurking in the back of your mind for years, taking up valuable mental space. With it all down on paper, you are able to free up your mind to really focus and give mental time to those things you have identified as really important and speaking to you at your very best. The rest of the Post-It notes go in the draw for a ‘someday’ – safely out of my thought process as I’ve now made a conscious commitment to where I want to go and what I want to do. And this isn’t something I just do with my work life. Towards the end of 2017, I sat down and did this exact same exercise with the family. 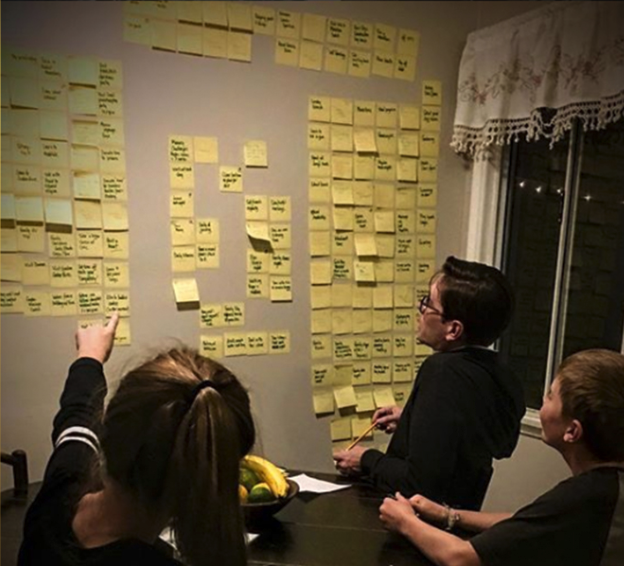 Each has a pen and Post-It notes pad and we set aside 60 minutes to write everything we wanted to do next year as a family. The kids said they were done after 5 minutes. But the rule was we had committed one hour of TIME to the exercise so they had to stay sitting with us for the full hour. Needless to say, ideas started popping into their heads and more Post-It notes were added to the pile. As a parent, the insight Amy and I got from this exercise was incredible. What was really important to Ella and Finn, things they had not voiced to us before. And from there we planned out our year. Have fun planning your 2019!